INDIANAPOLIS — We’re in the meat of the NFL combine, with player workouts and interviews underway as the draft picture begins to take shape. I’ll get to a few of the newsy nuggets delivered on the final day of media availability for head coaches and executives, but first, a behind-the-scenes fight that could shape the NFL agent business for years to come. This fall and winter, several agents felt the industry was reaching a tipping point in regard to player fees. The one-time industry standard of 3% slipped to 1.5% in August when the NFLPA changed the default language on the Standard Representation Agreement (SRA). Meanwhile, a minority of the largest agencies, including CAA, have recently made a practice of offering a sliding percentage scale to its newest clients, with a 1% fee should a player be chosen in the first round, according to agency sources. Smaller agents have since struggled to compete with the giants of the industry, leading veteran agents Vann McElroy, Pat Dye Jr. and Peter Schaffer to seek the creation of an association of like-minded agents to fight the new normal. McElroy and others fear that larger agencies will acquire talent in bulk, wholesaling their services and maximizing their profits with clients who live up to expectations and discarding those who don’t. Hesitation among agents being recruited to the new association is vast and multi-faceted. Some fear the association would ultimately hold little influence. Others fear the NFLPA will simply find ways to decertify those who participate, leaving their careers in ruin while other agents poach their clients. Still others have expressed concern about the credentials of the most vocal members of the association effort. • GAROPPOLO AND THE QB DOMINOES: How the Patriots’ (stated) desire to keep their back-up QB will affect the rest of the quarterback market as needy teams begin to assess their options. 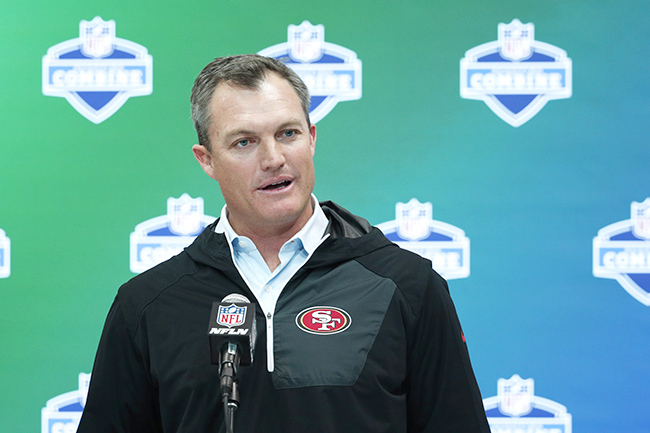 49ers GM John Lynch had nothing but praise for one of the top QB prospects. What’s Lynch looking for in a quarterback? He said a big source of inspiration and knowledge in his post-football career has been the production meetings he conducted with coaches and players while serving as a color commentator on Fox. • Raiders coach Jack Del Rio spoke at length on Thursday about how he would have liked the team to bounce back from the loss of quarterback Derek Carr, who suffered a season-ending leg injury on the eve of the playoffs, effectively ending Oakland’s resurgent 2016 campaign. “Regardless, if you lose your quarterback, to me there is still a way to get it done,” he said. “It just became a lot harder, but there is still a way. There was no concession and there never will be. Our approach is always: next man up and let's go compete. Del Rio said that sentiment will be an emphasis when the team reconvenes, but he admitted that the importance of the quarterback position, and the limits imposed by the new collective bargaining agreement on practice time and team contact in the offseason, makes preparing a viable backup one of the tallest tasks in the league today. Del Rio is not optimistic that a developmental league to replace NFL Europe, which folded in 2007, would ameliorate the effects of the bargaining agreement ratified in 2011. • What happened to Cam Newton? It’s one of the biggest questions Ron Rivera has faced this offseason following a lackluster 2016 for the then-reigning MVP. Rivera has chosen to retain his offensive staff, led by coordinator Mike Shula, and simply tweak the approach, preferring to maintain continuity rather than start over with a new group. The coach discussed the goal of Newton running the football less next year after the quarterback struggled through a shoulder injury and a concussion suffered in October. And Rivera fully expects Newton to revolt against the idea. “I promise you that’s going to happen,” Rivera said. “He wants the football, but we have to be very dogged in terms of what we’re going to do with him and how we’re going to do it. We have to pick and choose. It’s got to be the right situation and circumstances. • DAVID NJOKU AND THE COMBINE HEADLINERS: The high-jump national champ turned tight end can solidify his first-round status in Indianapolis. Plus, a handful of small-school stars to watch and everything else to know heading into combine week. Quarterbacks, wide receivers and tight ends will be made available to the media on Friday, which means Deshaun Watson, Mitch Trubisky and Kizer will face the assembled NFL media for the first time.